Professor Robert A. Foley researches and teaches human evolution at the University of Cambridge, where he is the Leverhulme Professor of Human Evolution. With Marta Mirazon Lahr he co-founded the Leverhulme Centre for Human Evolutionary Studies (LCHES), a research centre devoted to multi-disciplinary approaches to human evolution. H has worked on a range of topics, from the early hominins and bipedalism to the evolution of human social behaviour, to the origins of modern humans and historical linguistics and human diversity. What combines this research is a focus on evolutionary ecology, on applying Darwinian models to human evolution, and developing a comparative framework. Much of this work has been carried out in collaboration with Marta Mirazon Lahr. 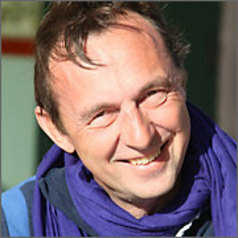 He has worked primarily in Africa, and is currently engaged in Mirazon Lahr's projects in the Central Sahara and Kenya.